In this Gigaom article I discuss the various places to buy a new Mac and the benefits and drawbacks of each choice. 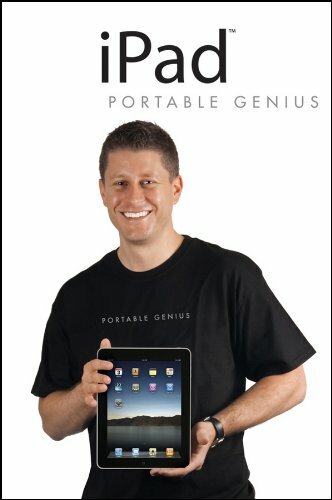 The "Portable Genius" line by Wiley is a relatively new series by them primarily designed to take advantage of Apple's unique meaning of the word "Genius." Primarily, they compete with the Peachpit Visual Quickstart guides. Using copious screenshots and short explanations of popular concepts, Portable Genius covers that 20% of features you'll use 80% of the time. Both the table of contents and the index allow readers to hone in on the key functions which interest them. Concepts are well explained in a "how do I?" and a "can I?" format instead of a feature- or app-based approach. New iPad users will find this presentation more approachable. Unfortunately iPad Portable Genius suffered from some poor editing in which too often the author didn't update the iOS steps that differ for an iPad and an iPhone or iPod Touch. On rare occasions, the advice given is controversial. For example, the author suggests if you can't sync all your content to your iPad you should consider deleting some content from your main computer. That is just irresponsible! Additionally the steps and screenshots in the book are primarily Macintosh based so Windows users might be a bit confused. 1) Generally all products reviewed were provided at no charge by the manufacturer or the manufacturer representative. This is a common industry practice Some companies allow the reviewer to keep the product while others ask for it in return. As a blogger, I don't know whether the product will be asked for in return. 2) Unsolicited products are occasionally sent to me. This is not due to any existing relationship with the company nor is it payment for any previous, current or future reviews. If I receive such items I may choose to review or decline to review. That is my choice. Due to the time constraints, I cannot tract down unsolicited items to return them. It's the responsibility of the sender to provide return instructions if they wish to receive it back. 3) Under no circumstances will I agree to review an item in exchange for direct or indirect compensation. A key example of this quid pro quo arrangement is "You must agree to review the product in exchange for a review copy of the product." That creates a conflict of interest that is unacceptable. Providing a product for review in no way obligates me to review the product and I as the reviewer will determine the timetable for review. Of course, the provider of the product may ask for it back at any time. 4) Under no circumstances will I accept compensation for a review. This includes reimbursement for buying the product or accessories as well any "gift" for reviewing the product. An unsolicited product is not a gift. 5) Any item reviewed has actually been used by me, often for an extended period of time. I do not "review by press release." Any books reviewed were actually read by me. Occasionally I will read other reviews of products for ideas of features to look for or consider in the review. 6) On occasion, for items I enthusiastically enjoy, I might continue use past the review date. Since the item is a review, most manufacturers can't accept payment for an item nor will they accept an item back that has been used. If I continue to use the product after a review, I will update or provide a new review if I find a major defect that would impact the original review. 7) Any products received by me are never sold to a third party, but they may occasionally be donated or gifted. Frequently, I give these as raffle items for the Lawrence Apple Users group. I might donate these items to non-profits or given to friends in need. Items at end of life are always recycled responsibility. 8) Reviews I write may be quoted as testimonials, but I do request notification of that fact. In spite of a product being given for review, these should not be considered paid testimonials nor endorsements. 9) All NDA's and embargoes are completely respected and adhered to. I use reasonable measures to protect against such disclosures, but with the nature of the Internet of course, email is not a fully secure method of transmission. 10) As someone with over 30 years experience in the technical industry, I develop a wide variety of industry contacts and relationships. While these relationships may bring certain items to my attention, I will decline to review or report on anything that may cause me a conflict of interest with those people or I think the review and the relationship may suffer because of it. Generally these contacts provide me unique industry insights and perspectives, but all the guidelines above apply. That includes such mundane things as a "dinner" thanking me for review or covering a story. iPhone cases seem to come in two different varieties: fashionable lightweights which look nice but provide poor protection and larger cases that add protection along with bulk. Personally I prefer function over form (Otterbox Defender!) but the Commuter is an excellent compromise that adds style and protection without a great deal of bulk. phone, providing shock protection, and then the aforementioned plastic piece, which slides over the back of the phone vertically as a band, providing further protection. Finally, there is a screen protector, which must be manually applied and is prone to bubbling. All together, these provide three layers of protection. against other objects, and sliding across tables, and it's dual layer protection is superior to the high fashion cases. Although, I didn't actually test intentionally dropping the phone, based on the construction of the case, I am pretty confident it would survive a short fall onto a hard surface unless you got unlucky enough to have something impact the front glass. I had enough close encounters with my iPhone 3GS and Commuter to trust Otterbox's design. the phone (such as around the screen and the mute switch) seemed to become dust magnets, although to be fair, many rubber cases have the same issue. Overall, the Commuter is a great balance of protection in a lightweight design that easily slides in and out of your pocket. For my spouse the protection the Commuter offers is "just right" - more protection than the "free cases" Apple offered, with a minimal amount of bulk. If the Otterbox iPhone 4 case was a car, the Commuter would be the luxury sedan while the Defender is a tank. Not everyone wants to drive a tank to work.